There’s a lot more to college dorm bedding than just your college comforter and sheets. 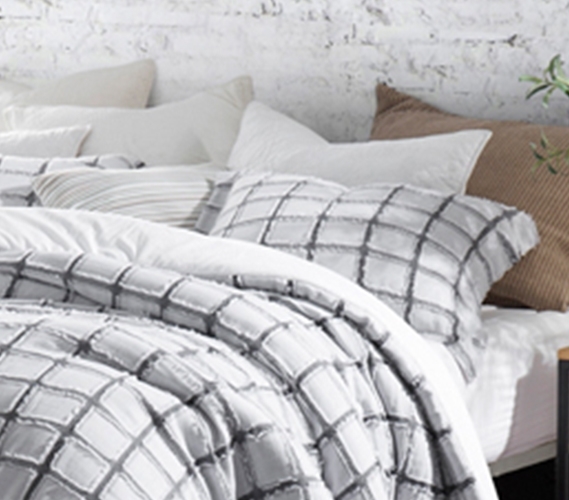 Add luxurious and unique style to your college dorm bedding with our Frayed Edgings Sham in White and Gray! Perfect for completing your Twin XL Bedding Set in Frayed Edgings or just adding that extra textured look to your dorm room décor, our Fray Edgings gives your dorm room a relaxed but sophisticated style without breaking the bank! Made with 100% cotton, our super soft Frayed Edgings sham for your college dorm bedding is easy to clean and perfect for using with any dorm style or decoration! A gray underlay on your sham is a perfect neutral for any college decorating style and the white, yarn dyed, frayed edgings gives your bedding a unique texture for an eye-popping college dorm bedding style. Our durable and super soft Frayed Edgings sham is perfect for adding a unique flair and a pop of texture to your relaxed and super comfortable dorm décor style.